So, besides Halloween, is your favorite time of the year Shark Week? Watching those majestic aquatic predators fearlessly rule over the sea is extraordinary to see. Some find it thrilling, others find it rather calming and soothing, but you’re a bit different, aren’t you? You see it as a way of life! Well, it’s time to finally start living out the life you’ve always wanted, that being one of a mighty Great White shark! All you need is this Men’s Shark Costume. 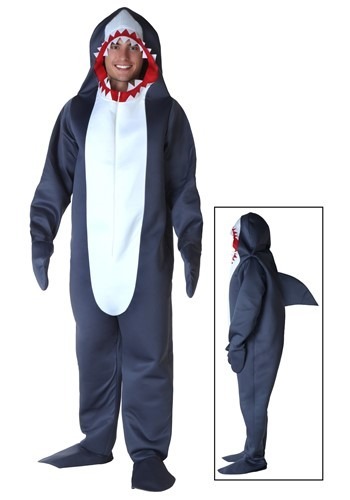 Get ready to be the king of the sea this Halloween, and really every day that you decide to wear this awesome Shark Costume. We made it ourselves for a shark enthusiast such as yourself. It has a glorious dorsal fin and a terrifying collection of teeth. You’ll feel ready to jump six feet out of the water and do a double back flip. You may have a sudden urge to jump in the water to join your shark brethren… we wouldn’t suggest you follow that desire. They swim up to 35mph! If you can’t keep up with them you’ll be the laughing stock of the sea. Avoid that embarrassment and just be the coolest shark at the costume parties this year! Grab this Great White jumpsuit and show off your unwavering love for these mighty sea dogs. You’ll be the king of the Halloween party sea-n and you’ll also finally get to live out your dream of being the ultimate underwater predator! That’s what we like to call a fin-fin situation… get it? !